Hoop earrings possess timeless appeal. Invest in these eye-catching, face-framing accessories; they’ll transform even your most basic tee into a bold style statement. The most common question women ask is, “What’s an ideal hoop size for my face?” The golden rule is: Longer than your jawline and no bigger than your fist, or at least two inches from your shoulder. have a wide/round face, you’ll look best in oval shaped hoops. Round hoops can fill out a gaunt face or soften an angular jawline. 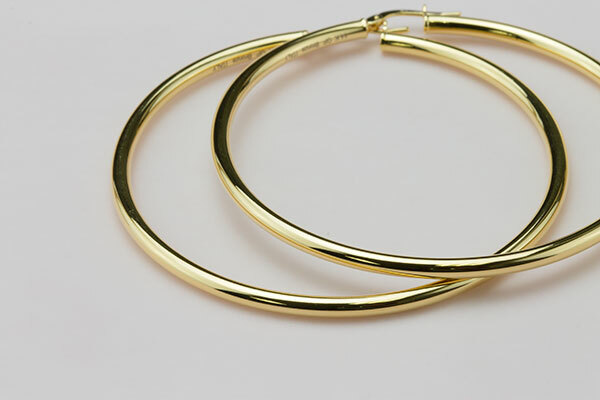 Start out with a basic pair of thin hoops, preferably midsize. Play around with different types of textures, like hammered, brushed or braided. Add some movement to your look with hoops of a slightly different shape. Hoops are meant to be the loudest part of your look. Style them with something plain, like a V-neck tee, and go easy on the lip color and the rest of your makeup. Pull your hair back for a more dramatic effect. Hoops are the little black dress of any jewelry collection, arguably one of the most versatile items in your jewelry box. Find a size and style that suits you; they’ll never fail to liven your look.